Discreet flawless service. Classic cocktails with a modern twist. Reliability. Three key phrases one has grown to expect from The Savoy. It’s name and reputation are things I have grown up with. It’s closure three years ago left me devastated (I hadn’t realised it was only for refurbishment), and after 3 years I had begun to doubt whether or not it would actually re-open. 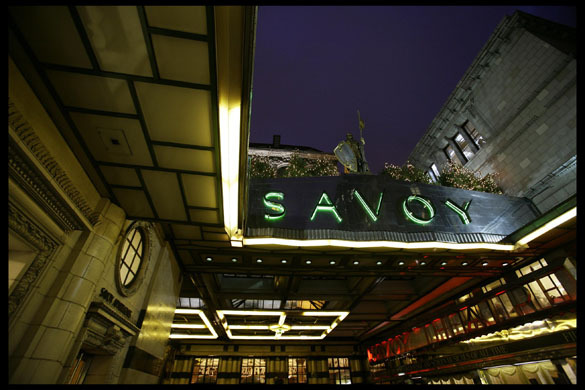 Within all the hype of the London Restaurant Festival, suddenly we hear that The Savoy is to reopen on 10.10.10 and the legendary tweeter / comedian /actor Stephen Fry was to be their first guest. Google must have been overwhelmed (I don’t imagine anything can overwhelm Google – certainly not collect personal details from people anyway) with people looking for photos of the new amazing, beautiful multi-million pound refurb. £629million was spent on this. £220,000,000 – that’s a crazy, crazy, loopy, eye-watering amount of money. How are they going to make it back? The investors must have the best interests of their Grandchildren in mind when they decided to shovel that dosh in! Anyhoo, it was (as some of you know) my birthday yesterday and my very kind and generous boss took me to the Beaufort Bar. Well, she tried to, and eventually succeeded… I should add that the success was 100% due to her perseverance and not the helpfulness of the hotel staff. The Beaufort Bar opens at 5.30pm. It ‘operates a no reservations policy.’ Fair enough, lots of places do, it was full when we arrived at 5.50pm, so we were offered the American Bar while we waited and were assured that the hostess would come and find us as soon as our TABLE because available, and that this wait would be around 35 minutes. The American Bar is, and I’m afraid there’s no escaping it, a classic ‘hotel bar’, but then maybe that’s the look they’re going for, the waitresses are smart and reasonably knowledgable, they delivered our drinks without fuss. The house Champagne, Louis Roederer, as yummy as usual with the Bloody Mary tasting marvellous once I could get to it through the iceberg that were cooling it… I kid you not, there were probably 2 pieces of ice in the glass but they were about the size of your average bar of Imperial Leather! There was also no straw so I managed to get some on my white top as it went over the top of the iceberg, down my chin and onto my jumper! CLASSY! 45 minutes and we had begun to wonder whether the magical book we’d had our names written in was a real book or something look efficient… The hostess tried to call the Beaufort Bar on her little headset thingy and had no response so my friend took matters into her own hands and went back to the Bar and was told they would have a table (after much deliberation from the hostess and the manager). She came back to pay (isn’t she nice…) and I headed to the Beaufort to be shown our TABLE. As I climbed onto the BAR stool that I was shown to my friend came back and reminded me that two stools at the bar DON’T equal a table, particularly after what ended up being an hours wait…. Hmmmmm. We asked and were grudgingly given a table (to cut the long story short). The cocktails are good. I won’t go as far as waxing lyrical about their imaginative wonders – because there isn’t anything to wax about. We tried a sharing cocktail that comes in a bird-cage – carried over on a tray, but there the magic ends as the glasses are unceremoniously placed on the table and the cage goes away with the waitress – ok so they probably aren’t cheap but come on Savoy – buy 4 and leave them on the table so people can actually have the excitement of taking their glasses out themselves. The Beaufort Bar’s service and cocktails, sadly just don’t live up to the lavish decor. It has got the potential to be an amazing experience for those spending £50 as well as those spending £500, but just sort the hostesses and managers out and make them look and sound like they know what they are doing and they are happy to be doing it! 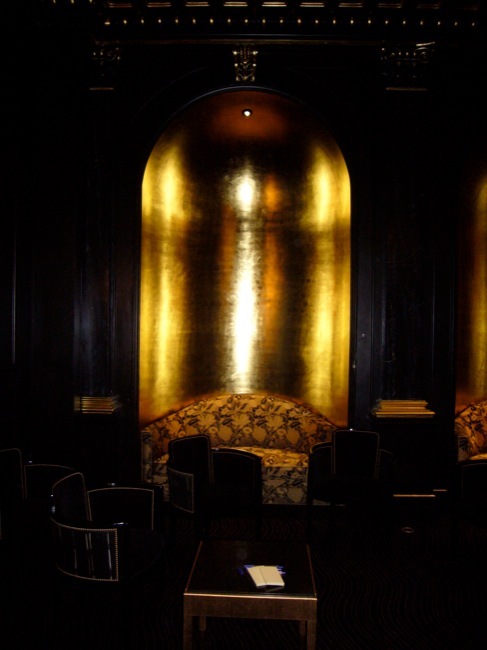 I am really glad I’ve been, as they refurb alone is worth the visit with the beautiful Beaufort Bar being the jewel in this extremely expensive makeover! My verdict – must try harder. The teething problems need to be ironed out asap – otherwise Christmas ain’t gonna be pretty! Wow. We’ve had experiences very much like this one before. All the ingredients are there for an amazing experience, but the lack of execution results in little to no follow-through. What a shame. Interesting comment about the American Bar, we spent a few hours there once after a meal in the Grill restaurant and thoroughly enjoyed it. With its menu of classic but well made cocktails, accompanied by a pianist singing classic swing and jazz songs, we had a great time until we were kicked out (not for rowdy behaviour – it was closing time!). No doubt we’ll make our way down there at some point soon, but I’ll bear your write up in mind and no doubt we’ll end up blogging our own experience so do drop by and see what we made of it.